What's orange and sounds like a parrot? My afternoon meeting was postponed until tomorrow morning - perfect chance to bag a barbel for the challenge. The afternoon looked great, so did the water, still topped up but not as murky as soup and not so clear the barbel could see me as soon as I stepped off the bus! 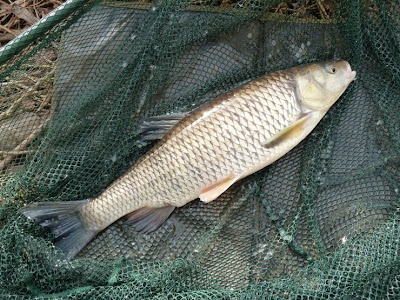 A cube of luncheon meat was cast out and soon the rod began to knock, a strike was met with a very hard fighting little chub about 2lb 8oz - I love it when you get a fish first cast, takes the pressure off. About an hour later after trying a few little holes and features my rod was away again, this time it was nearly ripped into the water. 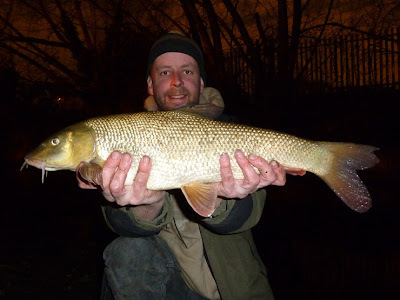 Another cracking fight and an 8lb 1oz barbel was in the net. Sorry, self-take photo and I didn't account for where the sun was. As darkness fell I had a bigger knock on the rod, then fall back, then knock, then fall back, then... Strike! 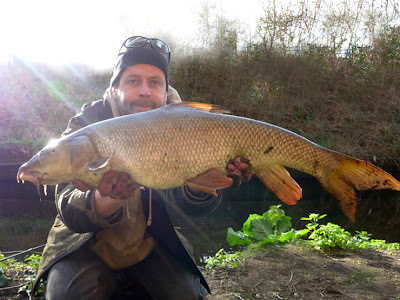 This fish has taken the crown as the hardest fighting barbel I've ever caught (from the six pounder last year). Real arm ache, I finally netted her about 50 yards down stream - I had to, I couldn't follow her any more. 7lb 12oz, I was expecting something twice the size, a better self-take this time. With the water thrashed to a foam every barbel in the area knew I was there, time for a long walk and another spot I fancied. Wrap around bite first cast - miss, wrap around bite next cast - miss, tree next cast - oops, fourth cast I connected. 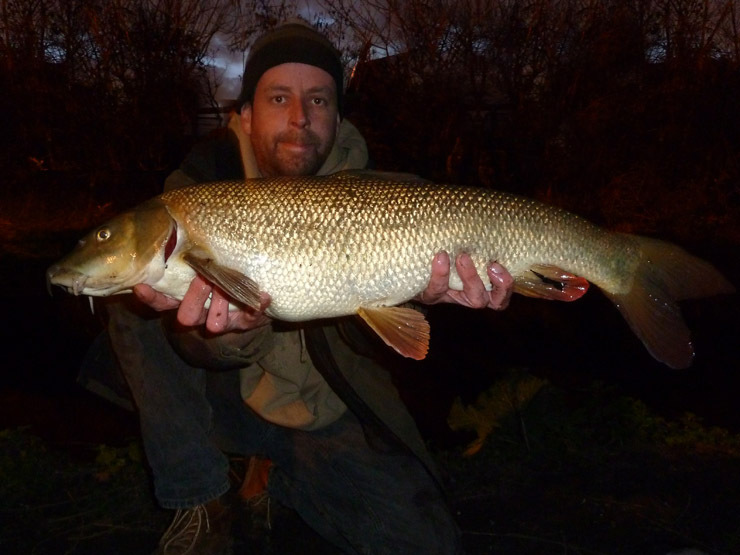 Another great fight and a 4lb 13oz barbel to end the day - fantastic. A carrot! I think the sun adds to the first photo. Good session, im off barbelling tomorrow morning, i'll let you know how I get on. Three barbel in a session is enough to put a smile on any angler's face. Nice work Brian! One barbel puts a smile on my face, but 3 for 20lb+ in one session in my best on the river yet! Lovely trip Brian and Iagree with Keith, that would put a smile on most anglers faces. The first picture of the Barbel in the sunlight is simply perfect. but I really like the picture where you're holding that 7lb 12oz, as the lights fading, it seems to bring out some wonderful colourings on the fish. Cheers Mark, getting better at these self-takes! A couple of lovely Barbel mate well in not long left now!